Which name should I enter in the field “Licensed to”? Here you can enter the name of your organisation. The name will be shown on the print output and can’t be changed after activation. Can the software be used in a remote desktop session (RDP)? This will only work in combination with a network license. Can a single network license be used over multiple branches and networks? No, this is not possible. Only users within the same network can use the network license. The workstations need a connection to the server location which contains the license file. Does the network license need a separate fileserver which controls the licenses? No, the network license just needs a shared folder on a fileserver in which the license file will be created. All users need read and write access to this folder. Can the software run on a Citrix or Terminal Server? Yes, a network license can be installed and activated on a Citrix or Terminal Server. A workstation license however cannot be used on a Citrix or Terminal Server. When starting NoiseAtWork I get the error message "Class not registered". What does that mean? 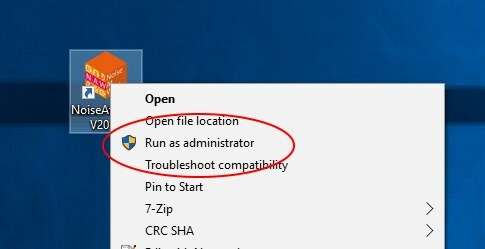 This problem can be solved by right mouse click the NoiseAtWork shortcut and select “Run as administrator” from the menu. Usually this error occurs when the product key is entered manually. We advise you to copy and paste the key from the original email message which you received from us or your local reseller. Another cause could be that you are using a product key for another (older) version of the software. Product keys can be used for 1 major version e.g. 5.x (5.0, 5.1 etc). For a new major version e.g. 2019.x you will need a new product key. In case of a 1 year rental you will receive a new product key directly from us that is valid for the remainder of the rental year. In case of a perpetual license you need to purchase an upgrade in order to obtain a new product key. This error message is caused by a wrong path in the License.cfg file. The License.cfg file should be present in the same program folder that contains the noiseatwork.exe file. 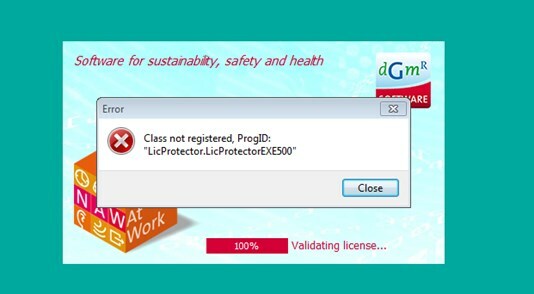 The license.cfg file is a text based file and contains the path to the shared folder on the network that contains the actual license file ‘naw500.lic’. When trying to activate NAW, I get error code 3001. What does that mean? Most probably the cause of this error is that NoiseAtWork does not have internet access, because it’s being blocked by a firewall. To solve this, you can try to add a “rule” in the firewall settings to allow internet access for NoiseAtWork, or you can temporarily turn off the firewall during activation of NoiseAtWork. If the problem is caused by wrong proxy settings then you can try to change the settings as described below. Check the settings in your Web Browser Tool and use the identical settings (e.g. to check the settings of Microsoft Internet Explorer you should open it and choose the menu Extras/Internet Options. Select TAB Connections and click on LAN Settings.). There you find the Proxy Server settings. In the Activation Dialog of Activation Server 4, you should click on the link “Proxy Settings”. If there is a Proxy Server set in your Web Browser, you should check “Use Proxy Server”. If you use Microsoft Internet Explorer simply check “Use settings from Internet Explorer”. If you use another Web Browser or you want to enter the Proxy Server data manually, don’t check “Use settings from Internet Explorer” but enter the address of your Proxy Server (IP address or server name) and your Proxy Port (mostly 80 or 8080). Copy these values from the settings in your Web Browser. When trying to activate a network license I get a License error code 1024 - The Installation Code of the license file does not match with Code 5. The error code means that there is a copy protection violation. It usually appears when the network contains a DFS (Distributed File System). Create a folder on the network in which the license file will be placed during activation. In this folder, users need full read/write access. Install NoiseAtWork and follow the directions of the setup program. During installation you will need to choose between “Workstation license” and “Network license”. Here you choose “Network license” (even if you install the software on a local computer). After setup has completed you can run NoiseAtWork and start activation using your network license key, which you received from us. When activation is done, the license folder will contain a file called NAW500.lic which is the activated license file. When you wish to change the location of the license file (for instance to a different server), you will first need to deactivate your license of NoiseAtWork. Please note: if your network contains multiple file servers and a DFS, you can’t enter the DFS name in your license path. You will need to enter the name of one of your servers. To activate NoiseAtWork you’ll need sufficient rights in the folder containing the license file. In case of a workstation license, the license file will be copied to the folder C:\ProgramData\NoiseAtWork\, in which it will be activated. Make sure that the Windows policy group “Users” has sufficient rights (read/write) in this folder. Also, it might be necessary to run the software as an administrator during activation. For this, right click the executable (NoiseAtWork.exe) and choose “Run as an Administrator”. In case of a network license, the license file will be copied to the server location which was entered during installation of NoiseAtWork. All users need read and write access to this folder.